Utilising player and game data to drive fan engagement is at the top of the priority list for Capgemini’s global innovation teams after the consulting group became a multi-year sponsor of the World Rugby Sevens Series. Speaking to CMO at the Sydney leg of the 10-tournament series, Capgemini’s global group marketing and communications director, Virginie Régis, said the decision to sign on as the game’s innovation partner was both a brand and recruitment exercise. It also comes two months after the organisation launched its fresh business strategy and new branding aiming at raising its profile as a digital and customer transformation player in the highly competitive consulting and agency space. “About a year ago, our CEO challenged us with our sponsoring strategy. The brief was to find something that both reflected the heritage of the group, and the identity of the group today,” Régis said. The EU$12.5 billion consulting group has had an affiliation with rugby for the past 25 years, largely through its sponsorship of two teams in France, where Capgemini is headquartered. In 2007, the group became a partner of the World Cup in Paris, and its founder, Serge Kampf, is also recognised a one of the “godfathers” of rugby in his home country, Régis said. 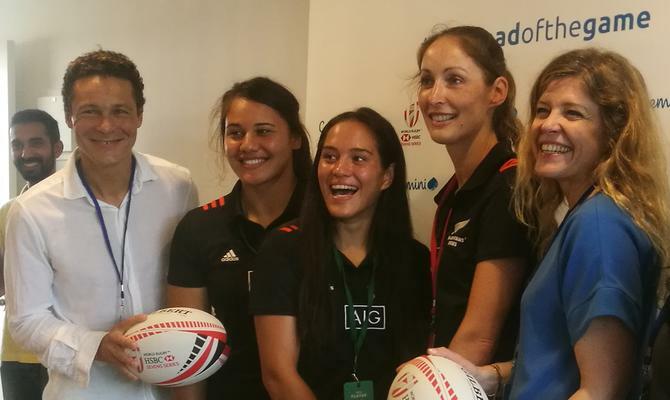 “There has always been a close relationship between our group and rugby, which you can even see in the values of our group, such as fun and team spirit,” she said. “But sponsoring two clubs in France no longer matched the fact that we’re very much an international business. France is only 20 per cent of our total revenue today. It was hard to explain to our colleagues in the UK or other countries why we were doing that. As a game format with an eight-month playing window annually, that features both male and female teams, and that is represented by a World Cup or Olympic Games every two years, frequency made Rugby Sevens a unique sport to leverage, Régis said. Capgemini is also looking to leverage the partnership when recruiting talent. The ‘innovation’ part of the partnership is about allowing Capgemini to bring its technology, data and customer insights expertise to the game itself. Régis said the emphasis is to leverage its expertise to assist with enhancing the fan experience. As a first step, Capgemini has gathered a team to run exploratory work with World Rugby made up of insights and data specialists. It’s also brought in colleagues from the Idean business, which Capgemini acquired in February 2017, who have an emphasis on customer experience design. Teams started work on pilot ideas during the tournament leg in South Africa in December, sitting with the fans and coaches and running workshops to embed themselves in the environment. A proof of concept was also on-hand in Sydney to Capgemini clients, based on existing data sets from the World Rugby organisation. In addition, staff were onsite during the three-day tournament over the Australia Day weekend. She noted fans in North America, for example, are often attending other sports and being exposed to insights around the performance of the teams and individual players. “When you sit with a coach next to you, it’s a very different game you’re watching and that’s what we were aiming to tap into,” Régis added. Closer to home, Capgemini A/NZ CEO, Nicolas Aidoud, pointed to the Australian Open as an example of how a wealth of data can be used to enhance real-time engagement with the game on and off the court. The Rugby Sevens is one of the few sports that doesn’t yet maximise technology visibly, Aidoud claimed, even as it has stores of data waiting to be utilised. “The partnership will create the opportunity to do more visible things with this data moving forward,” he said.